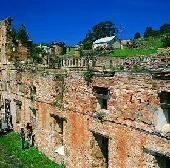 Access for two consecutive days to the Port Arthur Historic Site including over 30 buildings, ruins and gardens, 40 minute introductory walking tour, 25 minute harbour cruise. Introduction to Port Arthur walking tour: Join an expert guide for an overview of the history of Port Arthur - 40 mins approx. Harbour Cruise: Board the MV Marana for a cruise and commentary on Port Arthur's harbour; 25 mins. Interpretation Gallery: Play the Lottery of Life using the playing cards you are issued. Discover which convict your card representsand a little about his time at Port Arthur.Museum and Convict Study Centre: Located in the former Asylum adjacent to the Museum Coffee Shop, a fascinating display of objects made and used at Port Arthur.Convict Water Supply Trail and the Dockyard.